Ask Kris Batzner about RedBloom Yoga & Center for Community Wellness, and one of the first things she will tell you is she never wanted to owner a yoga studio. It may sound surprising, but it makes sense when Batzner explains her theories behind why she first started yoga, how her practice grew and how deeply she believes in community, particularly the city of Mt. Pleasant. The sense of belonging Batzner practices in her business and charitable works at RedBloom are why people feel comfortable there, she believes. By including wellness alongside yoga with massage therapists, reiki practitioners and other specialists has made the space at 206 West Michigan Street an inclusive place for any age, shape, gender or experience level. 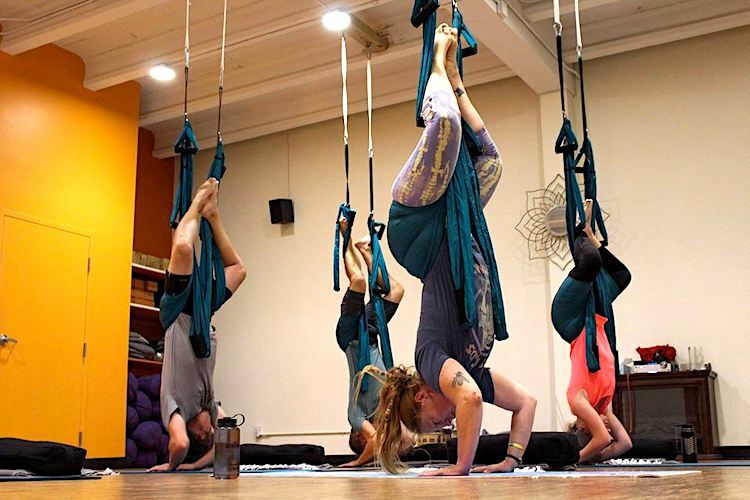 For Batzner, making sure every kind of body – from pregnant moms doing prenatal yoga to toddlers doing family yoga to any age trying Ascension Aerial yoga – could find a way to enjoy the exercise and practice that she loves was a priority over everything else. “I wanted to create a space or a community where people could practice together. They could feel comfortable,” Batzner said. Batzner practiced yoga throughout her life but truly made it a regular habit in 1998. Fast forward to 2008 when she was living in Orlando, Florida, and she started teaching yoga, Pilates and other fitness classes for kids and adults. She came back to Michigan and began to look for a new space and new yogi friends. She found more than one home – Batzner taught classes to anyone, anywhere. She named her new Mt. Pleasant yoga community Kula, and settled into the library annex and anywhere else that could host them. “I’d invite people to come practice with me, and it was a give what you could kind of thing. It was about being accessible. You didn’t need to be able to stand on your head or even touch your toes,” Batzner said. At its apex, Kula had members in two towns. Eleven instructors offered classes seven days a week. It was a bit of a logistical nightmare, Batzner remembered, so it was time to find a roof over their collective heads. Some people also were finding it challenging to practice their yoga in rooms filled with bookshelves or without carpet. As she and her then business partner started to look for a studio, Batzner’s daughter suggested they look at an available print shop. Batzner imagined it would be a difficult place to adapt to what she saw in her head, but it turned out to be ideal, she said. They added a large bathroom and after four months of construction, RedBloom was ready to go. RedBloom now has two massage therapists and a registered dietician who also is a nutritionist on staff. An osteopathic doctor comes in from Kalamazoo once a month to offer wellness help, and a reiki master sees clients in RedBloom’s office as well. In addition to regular class schedules and wellness services, RedBloom offers special events and classes depending on the season. There are beekeeping classes, moon-centered yoga, and a gong sound bath on the spring equinox to help people feel refreshed and ready for the warmer days ahead, Batzner said.